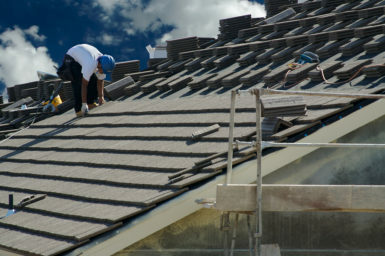 If you are having trouble choosing from among the roofing companies serving homeowners in the Maryville, Illinois area, look to Daech & Bauer Roofing. We’ve successfully completed more than 10,000 projects in our many years of operation, and we back our work with some of the best warranties around. And, while many roofing companies prefer to not get involved, we often help our customers navigate the sometimes-tricky insurance claims process. We will participate in the inspection by your insurance carrier to ensure all areas of damage are noted, and we will help you create a claim supplement if we feel that additional repairs are needed. Once the claim process is complete, our certified technicians will ensure that your roof is returned to optimal condition. Stop searching the roofing companies in the Maryville, IL area and contact Daech & Bauer Roofing today. One of our representatives would be happy to answer any questions you have.